The Committee Room is happy to begin its series on literary magazines with a profile of the Notre Dame Review, a journal of contemporary and international fiction, poetry, and criticism. Robert Pinsky, former Poet Laureate of the United States, called the Notre Dame Review "a lively, engaging, unpredictable literary journal." Sponsored by the Creative Writing Program at the University of Notre Dame, the NDR is a print journal published twice a year. 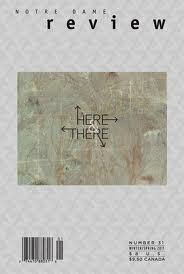 There is also an online companion nd [re]view. Founded in 1995, the NDR publishes the work of renown literary figures such as Nobel laureates Seamus Heaney and Czeslaw Milosz along with that of emerging writers. The NDR also sponsors the Sandeen Prize for Poetry and the Sullivan Prize for Short Fiction. In 2009, The Notre Dame Review: The First Ten Years, a "best of" volume featuring the work of Heaney, Milosz, Paul Muldoon, Denise Levertov, Richard Elman, and many others was published by the Notre Dame Press. TCR recently interviewed the NDR's editor, William O'Rourke, a prolific, witty, and opinionated novelist, essayist, blogger, and former Chicago Sun-Times columnist, to get his take on running a literary journal and on the literary world generally. Q: How long have you been at the NDR? A: I have been at the NDR since its beginning in 1995 and at Notre Dame since 1981. I was the founding director of Notre Dame’s graduate creative writing program, which began in 1990. My vision was to have three things happen, more or less, at once: create a program, start a national literary magazine, and begin a publishing series of both poetry and prose. All three occurred. Valerie Sayers started the magazine in 1995, after joining the faculty a year earlier (and she also took over the program’s directorship at that time). I began the Sandeen/Sullivan prize series with the Notre Dame Press. Everything needed to be doable, since we were operating with limited resources. Our program was very grass roots, having sprung out of the work of the interested people in the English Department. It was bottom up, not top down. "The 60s and 70s were the last golden age of reading, before the onset of technology began to control everyone’s time and attention." Q: How has the literary world changed, for good or bad, since you arrived on the scene forty years ago? A: When I began as a writer, I went to Columbia University’s new graduate creative writing program in 1968. There were only a handful back then in existence and Columbia provided me a port in the storm of New York City. The growth period for graduate creative writing programs was the 70s-80s (ND got on the bandwagon after the wagon stopped moving in 1990.) Bohemia was outsourced to college towns as the literary life in the big cities became too expensive for starving artists. The starving was taken to the suburbs and the depopulating regions of the country. But the biggest thing that has changed is the nature of reading. The 60s and 70s were the last golden age of reading, before the onset of technology began to control everyone’s time and attention. VCRs first, then the internet and all its spawn. We invited Big Brother into our lives and now contemporary literature plays a far less significant role in the culture (though a larger one in English departments.) 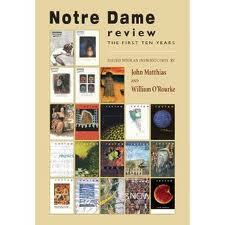 In 2009, the Notre Dame Press published Notre Dame Review: The First Ten Years, a “best of” volume. It has introductions by both myself and John Matthias, my coeditor, which go into the changes over time in the literary world. And I have a book coming out in 2012, to be published by Indiana University Press, Confessions of a Guilty Freelancer, which covers some of the same ground. Q: What is the NDR's circulation? A: 1,500. Five hundred of which are subscriptions and the rest distributed one way or another. It’s about the same press run as novels or short stories published by most small presses. Or even a bit larger. Q: What are the NDR's distribution channels? A: Over the years we have been distributed by Ubiquity, Media Solutions, and Ingram, and others,though distributors have been harder to keep, given the general decline in bookstore sales. Q: Who are the NDR's readers? A: The same folk who read other literary journals. The young (and old) who hang out at bookstores and all those who are interested in the literary world in general. Q: What separates the NDR from countless other American literary journals? A: The taste of the editors. A: See the poems and prose in the last issue, No. 31 (or any issue.) Start with David Matlin’s story “California City,” and John Wilkinson’s poem “Terre Haute”. For those who wouldn’t know, Terre Haute is the city in Indiana which houses the prison which executes prisoners. And the home of Eugene V. Debs. Q: What are the NDR's sources of funding? A: We are subsidized by the College of Arts & Letters of the University of Notre Dame and by “Sustainers” listed in the magazine, as well as by subscribers and purchasers of the magazine. "We intend to shock the bourgeois only by the merit of what we publish." Q: Does the NDR's connection a Catholic university (probably the most prominent Catholic university in the US) influence its content in any way? A: We are firmly set in a global literary tradition, humanistic in its values, aware of the mission of the University. We haven’t had any censorship issues (though that isn’t to say we couldn’t have encountered them). We intend to shock the bourgeois only by the merit of what we publish. Q: How does the NDR or any university-based, MFA program connected, literary journal keep from becoming an academic publication read only by people in the “field” of creative writing? A: By getting out into the public and being recommended by those in the field to those who are not in the field. And we have had short stories and poems republished in the Best American and Pushcart series. Those anthologies, especially the Best American, have wider circulations. And, of course, there is the internet, and who knows who is looking through that keyhole? Q: How many submissions does the NDR receive in a typical month? A: Over a hundred a month. We take submissions from September to March and nearly a thousand -- roughly half prose, half poetry -- arrive. Q: What is the NDR's editorial process? A: Everything gets read. Often more than once by more than one person. Graduate students do the first reading but a faculty editor looks at everything they read, so at least two people have read everything. The poetry side is very efficient; the prose side not as good. The fiction editor champions multiple submission, in order to feel less guilty. Q: What percentage of submissions don't get past an initial reading? A: About eighty percent doesn’t go to the upper editors. Q: What are some common reasons why manuscripts are rejected? A: It’s the usual mix of reasons: subject, execution, reach, level of accomplishment, general literacy and effect. Q: What is the role of the NDR's online element nd [re]view? A: It is an extension of the magazine, extra material that would make any issue too long (we now average around two-hundred fifty pages per issue) -- photographs, other pieces of poetry and prose, more interviews and the endless links. I believe that the internet is “free”, only insofar that one can fill it up with material and not sacrifice any trees or printing budgets. Q: In a 2010 interview with the Huffington Post you said – “It's an aural-visual world today, not a literate one...Poetry might well profit over time, given its usual length, size, but not, alas, I think, fiction.” Could you elaborate on that? A: The paradox of the internet is, though, as mentioned above, it can print endless reams of work, it is a medium that seems to entertain short attention spans and is most suitable for short lengths of both poetry and prose. As Chekov didn’t say, brevity is the sister of the web site. And the search engine makes the part greater than the whole. Q: What are the biggest challenges one faces in running a literary journal? A: Other than answering interview questions? Doing what matters and making it matter, while not deepening one’s own cynicism. In other words, staying generous. "17 Literary Journals That Might Survive the Internet," Huffington Post, August 14, 2010. In my view i would say the interview was intense and with a lot of constructive queries to Mr. William. Thank you for sharing this review with us as we looking forward to your next blog post. Phenomenal Blog! I may want to thank for the endeavors you have produced in composing this post. I'm trusting the exact same best work from you later on too.